This colt is our first out of Call Me Nifty Tu and Skip Off Leotyne. He is very friendly and is all quarter horse. He has been easy to train and is going to make an awesome trail or show horse. He will easily reach 15.3hh at maturity. This colt is our first out of Call Me Nifty Tu and Skips Star D Or. He is very friendly and is all quarter horse. Big and stocky from day one, he will be a beautiful golden palomino color. 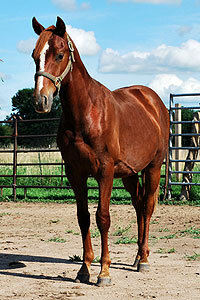 He has great conformation and will make a great performance horse. Doing very well with ground manners. Halters, leads and ties. Coco arrived on the evening of April 1st. 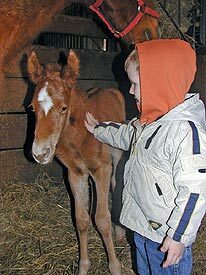 The boys and I were camping in the truck in front of the corral and stall when she was born. It was very exciting and they learned a lot that night. As for Coco, she was very leggy when she came out and full of energy. Her first week she was bouncing off the stall. We received non-stop rain in April so once we finally put her outside full time she has been a much happier gal. She loves attention and gets along with anybody who wants to come over to love on her. 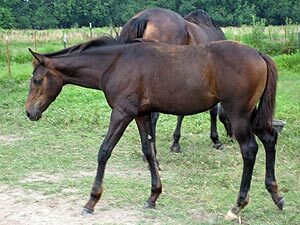 She has matured nicely and is short-backed with a flat knee and nice hip. We have began working her on the lunge line and hope to get a saddle on her before winter. Lungeing video available at youtube.com at http://www.youtube.com/watch?v=X9xzEa8LjSo Reasonable offers considered. Sweetie has loads of personality and loves visitors. She has enjoyed time with our boys, and the dogs. Her favorite dog friend is our big, black Lab named "Mimi" who has given her lots of kisses on the nose. 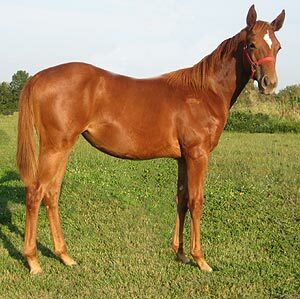 Sweetie is a full sister to Paulies Lil Dixie, a chestnut mare listed on our mares page that we are now riding and is very easy going willing mare who is a joy to ride. 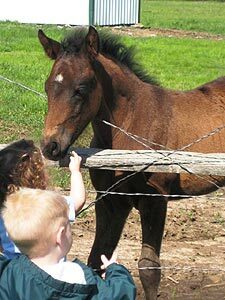 Sweetie will make a nice all around horse for the whole family -- ours or yours! 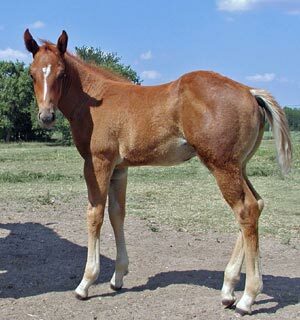 This colt is built nice and is bred to be a performer. We are excited to watch him grow and will continue to post pictures as he matures. He has a flaxen mane and tail and some chrome on him to boot. 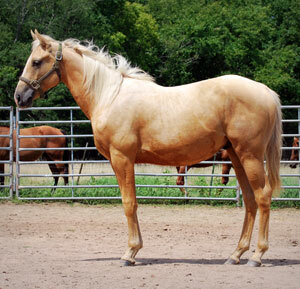 His sire is Unique Sheik, a 1994 sorrel stallion out of Sheiks Whim. Sheiks Whim accumulated the following in his show career: Superior Halter (1987-Open), High Point Halter Stallion (1987-Open), High Point Junior Halter Stallion (1987-Open), World Show 3YO Stallion 4th place (1987-Open). 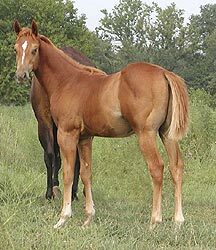 He earned 78 Halter wins, 135.0 Halter Points, 1 Halter Superior Award, 76 Grand Championships, 26 Reserve Grand Championships, 1 High Point Earned. 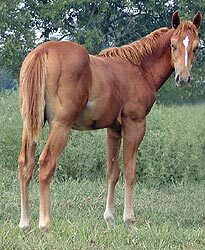 Unique Sheik's dam Unique Feature is the dam of 9 foals, of which 5 were performers: Kir Boomer, 1991 Sorrel Gelding by Sheiks Whim, Kir Mattie 1992 Chestnut Mare by Sheiks Whim, Dibs on Dude 1995 Chestnut Gelding by How D Dreamy Dude, Too Cool Dude 1999 Sorrel Stallion by How D Dreamy Dude, Unique Conclusion 2000 Sorrel Stallion by Obviously In Command. 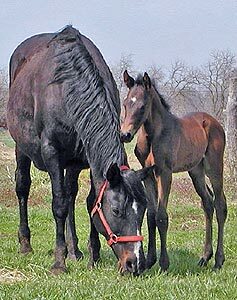 His Dam is by Classical Aid by Classical Skipper and is also double bred Scottish Will on her sire and dam's side. 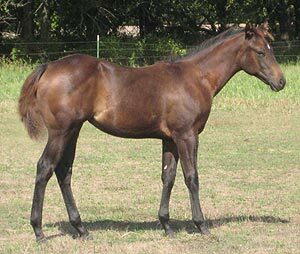 She also is out of Whammys Aid by Whammy Cat, the same sire as our stud Whammy Ball. 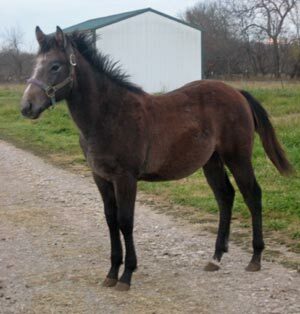 Scotts Classy is a quiet easy going mare and her disposition can already be seen in this new colt. Slip is a nicely built colt that is easy to handle. He is owned by the Bill J. Brynds Farm. He has the pedigree for the show ring and Bill intends to give him the opportunity to prove himself. We will keep you updated on his progress and success.